Getting to know Elise Purdon | Creative mind behind Élise Silk Loungewear. By way of the Instagram Press we stumbled upon Elise Purdon's prêt-à-photographier silk loungewear. It turns out she's also Canadian, hailing from Victoria B.C. Obviously we had to get in touch with her! A local lady killing it in lingerie? It's the stuff we live for here at CC. Creative mind behind a popular West Coast fashion and lifestyle blog, Elise Purdon was inspired to start her own business by the opportunity to have creative freedom in her work. Combining cues from Coco Chanel and Hugh Hefner, with a love for underwear as outerwear led her to create ÉLISE Silk Loungewear. A girl who knows silk and style? We knew we had to get to know her better. Élise is made outside Suzhou in China, one of the original ports of the silk road. This part of world has vast expertise in both making and working with silk. All ÉLISE garments are made from 100% pure silk charmeuse that is harvested, woven and sewn within a few square kilometres. The silk is 18mm making it some of the thickest, most luxurious silk around. The label's premier collection, The Unbridled, was launched this past December. The timing couldn't be more perfect. Something special happens when lingerie meets street style, and pajamas are no exception. The pajama trend most recently made a resurgence on the Spring/Summer 2016 runways. 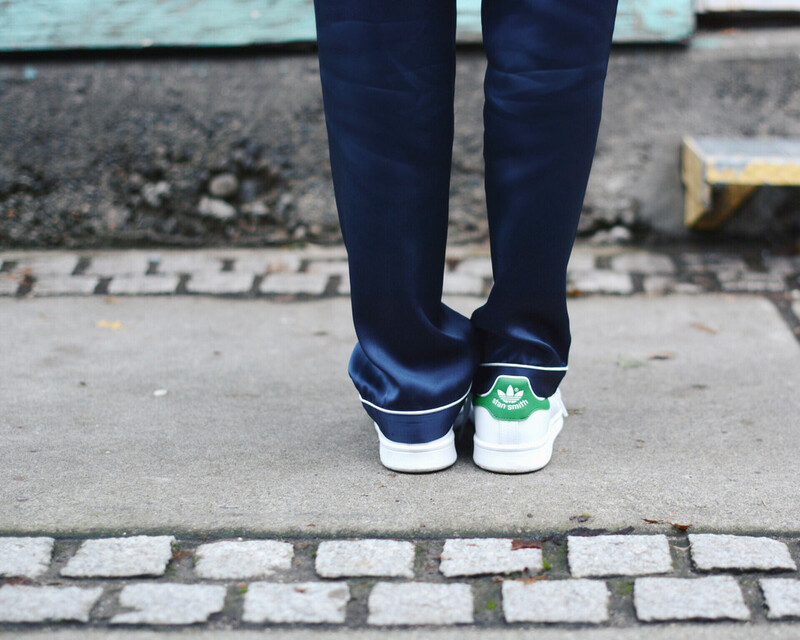 Fashionistas, both on the red carpet and on the street, have embraced the trend with open arms. One look at Elise's chic styling: from day to night, in sneakers and stilettos, and it's easy to see what all the fuss is about. Elise tells us that we can expect an extension of the collection (she's keeping it quiet on the details though). She does however promise banana leaf prints for the summer. Can we just say how much we love that idea!? Coffee, chocolate, wine, reading, shopping & silk. That is my life in a nutshell. I am obsessed with glamour, but also being comfortable. Sweet until the end of time. I live for both. Saturday night wine with friends and slow Sunday morning lattés. Mary Kate & Ashley Olsen; they have impeccable style and business brains to go with it. I just wish they didn't smoke. Instagram by far! It's so creative and beautiful. I would quit Facebook altogether if it wasn't a useful business tool. Moist. I can't even write it. Honestly, coffee gets me out of bed in the morning. Once that's done I usually head straight to my email to see what exciting projects are coming my way! What do you struggle with everyday? Not many people know this, but I struggle with chronic migraine pain, so I get a headache every day. This is by far the thing that I struggle with most. Lemongrass. This is probably due to the fact that I spent 6 years in Thailand. The Game of Thrones Prelude (I'm secretly a huge geek). Most recent addition to your lingerie drawer? Not even lying, it's the ÉLISE Camellia Silk Pajama in Frosted Pearl. Contrary to popular belief, the designer often doesn't instantly get the whole collection. Shop Élise here and visit her blog A Piece of Elise. We're not lying either. 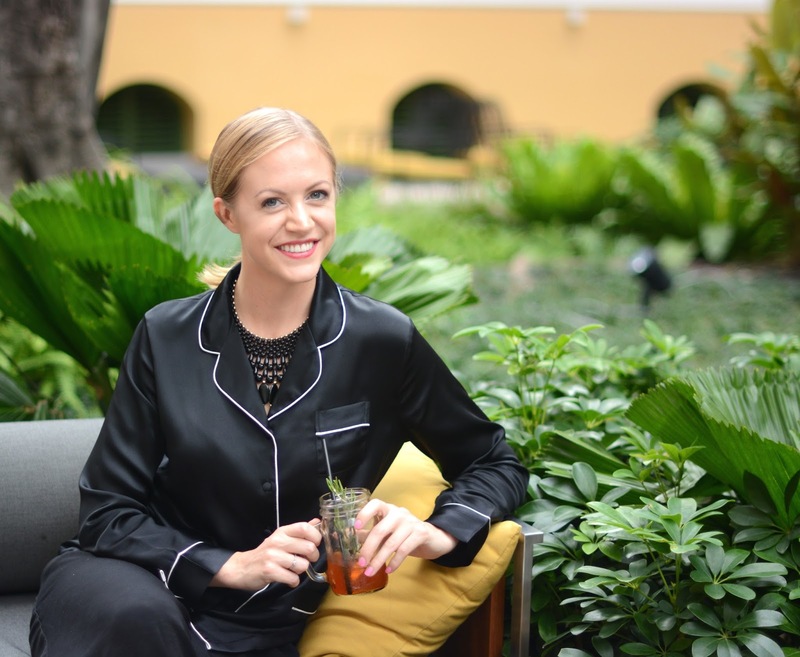 We're over-the-top excited about silk pajamas in banana leaf!